Heat oven to 350°F (325°F for a dark or nonstick pan). Lightly grease and flour a 9-by-5-inch loaf pan; set aside. To make the mint cake: In the bowl of a stand mixer, beat together butter and sugar on medium speed until light and fluffy, about 5 minutes. Add eggs, beating one at a time, until incorporated. In a large bowl, whisk together flour, baking powder, baking soda and salt. In a separate small bowl, whisk together buttermilk, peppermint extract and about 20 drops green food coloring. 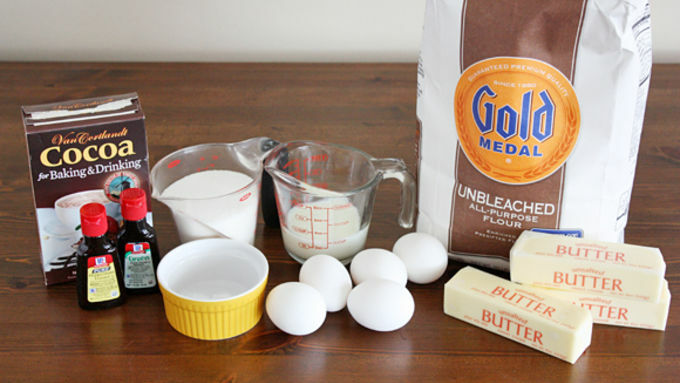 Alternately add flour and buttermilk mixtures to the butter mixture, beginning and ending with the flour, until all ingredients are just combined. Bake until a toothpick inserted in the center comes out clean, about 1 hour. Remove from oven; cool 10 minutes in loaf pan. Remove from pan and cool completely on a cooling rack. When mint cake is completely cool, make the chocolate cake batter: In the bowl of a stand mixer, beat together butter and sugar on medium speed until light and fluffy, about 5 minutes. Add eggs, beating one at a time, until incorporated. In a large bowl, whisk together flour, baking powder, baking soda and salt. Alternately add flour mixture and buttermilk to the butter mixture, beginning and ending with the flour, until all ingredients are just combined. Add cocoa powder and stir to combine. Set batter aside. 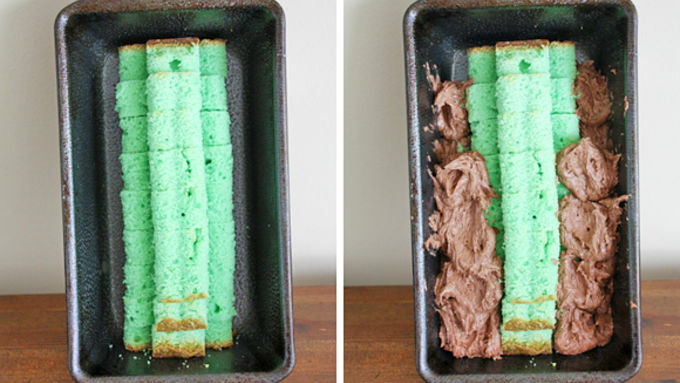 Slice mint pound cake into 1-inch thick slices. 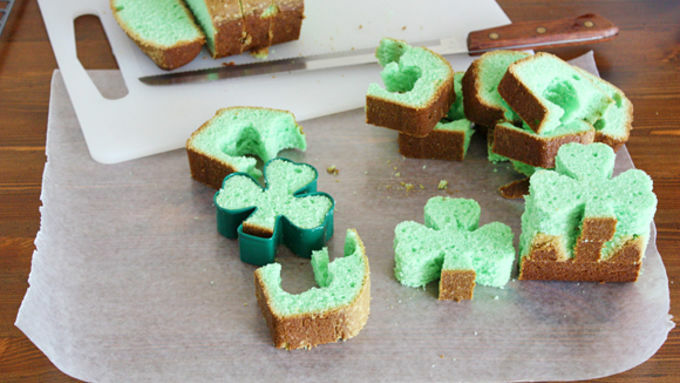 Using a 3-inch wide shamrock cookie cutter, cut a shamrock shape out of each cake slice. 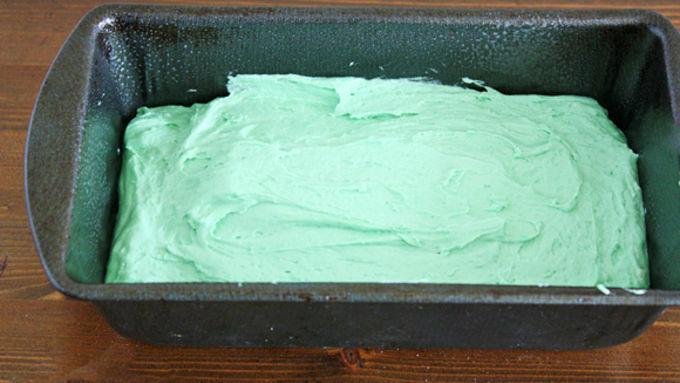 Lightly grease and flour a clean 9-by-5-inch loaf pan; carefully prop the pan upright vertically. 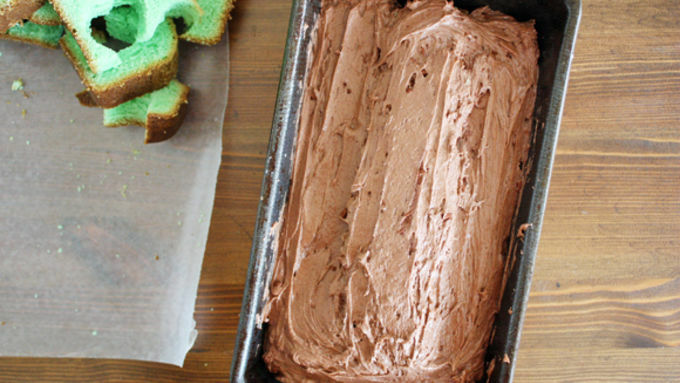 Carefully stack shamrock shapes on top of each other in center of loaf pan. Use a spoon to carefully place batter on either side of shamrock shapes to hold them in place. Carefully cover the rest of the shamrocks with batter; smooth top (you might not use all of the chocolate batter). Bake cake until a toothpick inserted in the center of the chocolate part comes out clean, about 45 minutes to 1 hour. 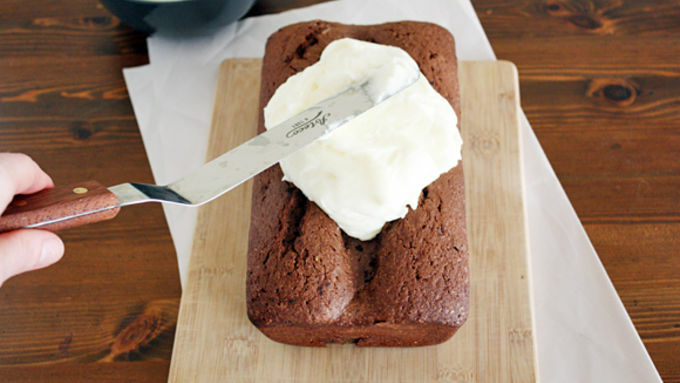 Let cake cool in pan 10 minutes, then remove from pan and cool completely on a cooling rack. Meanwhile, make the frosting: Beat all ingredients together until light and fluffy, adding more powdered sugar or milk to achieve desired consistency. Frost top of fully cooled cake with frosting. Slice and see the shamrock revealed! 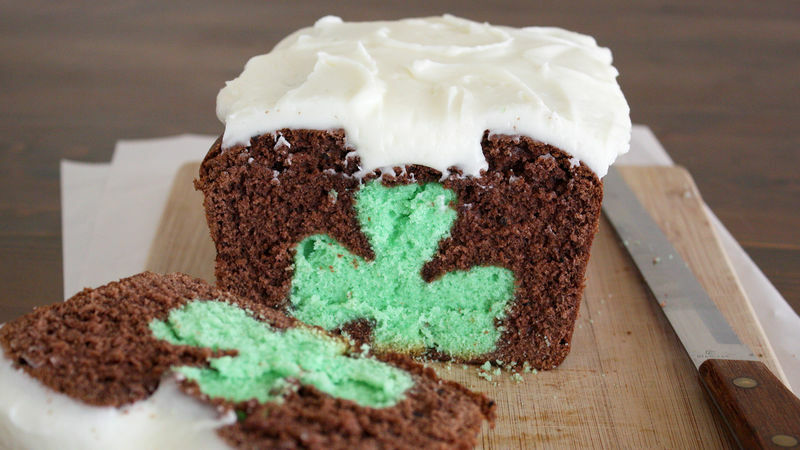 Dude, there’s a shamrock in your pound cake. 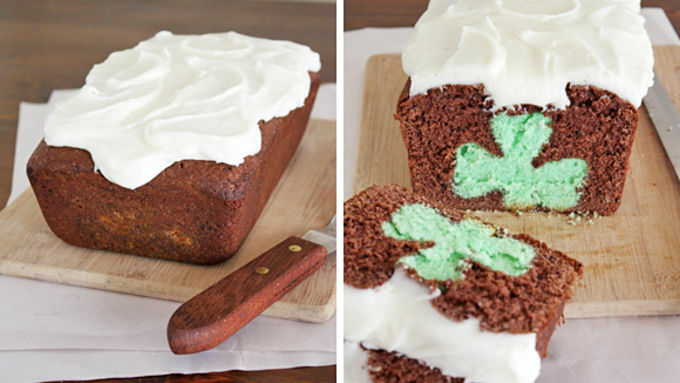 It ain’t no luck of the Irish – there is, in fact, a shamrock hiding inside this mint-chocolate flavored pound cake. And if you follow these directions below, you can make it happen. Oh yes. Firstly, make sure you have all the ingredients you need to make this cake. It’s a wee time consuming, so the last thing you want to encounter is a missing egg or a lack of milk. Also, some of the ingredients need to be at room temperature, so be sure to leave those out for a few hours ahead of time. 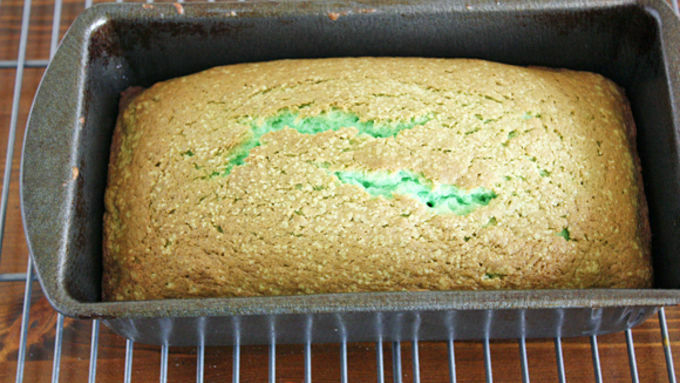 Wow your friends and fellow St. Patrick’s Day revelers with this snazzy cake magic. It’s the next best thing to getting a pot of gold at the end of a rainbow. Mmm, cake!